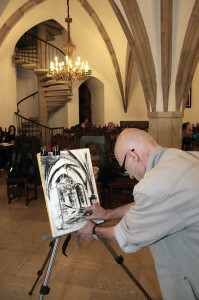 Plein air sessions for disabled artists, inaugurated in 1999 by the Cracow Saltworks Museum and the Foundation of Art of Disabled Persons, have become a fixed element of the agenda of events organized by both institutions. Apart from artistic accomplishments supporting the process of rehabilitation, plein air sessions are also an opportunity to be alone, to forget about the illness, to get to know new people and to visit interesting places, to discover oneself and to improve one’s skills. Enthusiasm, gratitude and joy deriving from creation convince us that this idea is valuable and worth continuing.